The Sixers didn't have Ben Simmons, they had Joel Embiid in early foul trouble, and they had to stand across from Blake Griffin as he had what may have been the best game he has ever played in his career. And so perhaps it should not have been a surprise that the Sixers fell in a heartbreaker, a 133-132 loss to the Pistons in Detroit. We'll discuss some in-depth things tomorrow, but for now, here are some instant thoughts to chew on heading into tomorrow's game in Milwaukee. • Amir Johnson has one of the most awkward-looking games on offense you're likely to see in the modern NBA. Guys who are as gangly and seemingly disjointed as him tend to be asked to finish lobs and that's it, but he doesn't have the hops to do that, either. So instead, he comes cruising down the lane and uses a combination of old-man knowhow and craft to make it happen at the basket. After Embiid went out with foul trouble in the first quarter, it was Johnson who stepped up the most on offense for Philadelphia — at least outside of the usual suspects — depositing a couple tough finishes around the rim in the first quarter. • Markelle Fultz became the youngest player to record a triple-double in NBA history to close out last regular season, but I would argue he has never had a more encouraging stretch of basketball than we saw in the first half on Tuesday. With Ben Simmons taking the night off with back tightness, Fultz and his scoring mentality came to the forefront. Most people's attention will drift toward the corner three he nailed, and that is indeed a huge shot for Fultz to even attempt, let alone make. But it was the combination of inside-out play that should be noted because Fultz has struggled on both ends of the offensive spectrum early in his career. Finishing through and/or around rim protection was an issue for Fultz at the end of last year and has persisted through the preseason and the first few games of this young season. You wouldn't have guessed that watching his first-half performance, as he used Euro steps to maneuver around defenders, length to finish over the top of Andre Drummond, and would have had an assist or two on top of that if his teammates had knocked down open looks he created for them. Fultz's issue to date has primarily been the jumper, but he would be able to get away with that to some degree if he can improve his efficiency at the rim. The scorer's craft is within him somewhere, and it's just a matter of unleashing it on a consistent basis. • Silly though his early foul trouble may have been, Embiid's performance on offense Tuesday night was absolutely bonkers. There was a sequence midway through the second quarter where the big man either scored, assisted, or was fouled on five straight possessions, sending poor backup center Zaza Pachulia to the shadow realm. Despite missing the final 9:04 of the first quarter, the young center still managed to put up 17 points on just eight shots in the first half, making the most of his time. He has been on a scoring tear to start the year, and while he has been cryptic on what exactly he worked on with trainer Drew Hanlen — Embiid tends to just say "everything" when a new reporter inquires on the subject at practice or postgame — it certainly looks like there's some truth to that. My personal favorite in the current arsenal: Embiid's propensity to Euro-step all over opponents at least once a game. He hasn't been shy about it so far this year, and we saw him bust out another huge one in the first half against Detroit. Joel Embiid euro-steps his way to the bucket! More central to the night's theme, Embiid absolutely abused Pistons center Andre Drummond on both ends. Drummond's attempts to score often turned into him falling all over himself, too mentally checked out to even bother appealing to the officials for a foul call. It's hard to be terribly inefficient as a big man who only operates near the basket, but Drummond was 4/17 through three quarters and did absolutely nothing to slow Embiid down on defense, either. There are few things more fun during the grind of an NBA season than seeing guys take specific matchups personally, and Embiid does this with quite a few big men around the league. He talked his trash with Drummond and backed it up, leaving his opponent helpless time and time again. When Embiid has it going like that, good luck. • Fultz's end-of-quarter three to close the third got blocked, and it almost feels weird to put something like that in the "good" category. But the fact that he actively sought out the shot is a step in the right direction, and I am all for looking for signs of him turning the corner in his areas of weakness. Let that thing fly, kid. What can you even say about this guy? Has his limitations, but he's tough as nails, fearless in the clutch, and has delivered in every big moment so far this year. Unbelievable shot in overtime, but the defense let Philadelphia down. • Joel Embiid's combination of effort, athleticism, and passion for defense are a head coach's dream, and Brett Brown rightly lauds his star player for his impact on that side of the floor. But the last part can lead him astray at times, as it did when he picked up an early second foul on Tuesday night. Embiid is intelligent enough (and frankly, big enough) to navigate a game while not exposing himself to additional fouls after picking up a cheap one early in the game. But he crashed into Blake Griffin trying to play help defense, and less than three minutes in Brown was forced to send him to the bench for a bit. I'm normally on board with letting guys play through foul trouble, but when your first two fouls come in the first three minutes of the game, you force the coach's hand to a degree. Have to be better with Ben Simmons on the shelf — especially because he was so good when he was on the floor! • At the start of the game, I was prepared to skewer Dario Saric for getting torched by Blake Griffin on the defensive end. And in fairness, he did not exactly offer a lot of resistance as Griffin made him look foolish on the low block. But Griffin just had everything working on Tuesday night, and even the best defensive possessions from the likes of Saric and newcomer Mike Muscala ended in Pistons buckets. Griffin was not known for his touch when he was a high-wire act early in his Clippers days, but every junk shot he threw up seemed to have the perfect weight when it hit the rim, rolling softly into the net. Sometimes you're going to be on the receiving end of a hot shooting performance. If not for Griffin's struggles at the free-throw line, it would have been even worse for Philadelphia. Tip your cap to him for that performance — that might have been the best game of his career, frankly. • Fultz's offensive effort was encouraging, but man does he get eaten alive by screens at this stage of his career. He may already pretty decent at using his length to bother other players or come up with chasedown blocks, but he has a lot of work to do before he can be a legitimately impactful defender. And that's kinda fine. Young players are almost universally bad defenders, and the Sixers can live with that if he comes through on offense. 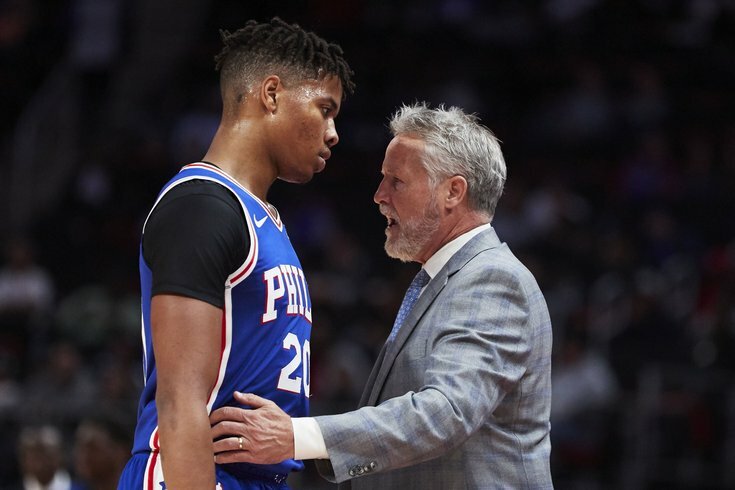 • I understand Brett Brown wants to go to a player he trusts in crunch time in T.J. McConnell, and the Sixers were walking a razor's edge the entire game without Simmons to help bury the Pistons. But that was a prime opportunity to let Fultz try to walk the game down, and Brown opted to not even give him a shot. If the Sixers do indeed want to try to develop Fultz, they can't hide him when the moment is brightest. Another opportunity presented itself in OT, and Brown decided to keep rolling with McConnell. Don't like the process, regardless of the result. And the result wasn't good either! • On a different note — Dario Saric was straight up bad against Detroit. If not for a game-changing play on defense with less than a minute to play (and a huge rebound in traffic to set up the final possession), he would have been just about a zero for the night. He needs to do more, especially when Simmons is on the shelf. • Let us never have to see a McConnell—Redick—Shamet—Muscala—Johnson lineup ever again. • Robert Covington absolutely lost his mind on the final defensive play. Amir Johnson was on the floor, for some unknown reason, was on the floor for the final defensive play. Bonehead mistake from a player, bonehead mistake from the coach. Bad at just about every level. The Brown mistake is the one that I think deserves the most criticism. Johnson can't defend fives in space anymore, so why Brown thought he'd be able to quickly adjust while guarding a four — and one who was on the cusp of scoring 50 points — is beyond me. Covington screwing up on a misguided attempt to make a play was terrible, but at least you can understand it happening in the heat of the moment. A brutal way to lose what was otherwise a pretty great game. We'll have more on this tomorrow.